Today I am grateful for my crappy recliner. It is a pretty sad day when the thrift store guys who are picking up your recliner and the chair with ottoman, refuse to take the recliner because it’s too crappy and in bad shape. Wow. And I sit in it every night. In all of its crappiness. Just crappy me in crappy it. When my son strong armed our thrift store purchased, two-end-recliner-with-one-broken-end couch to the curb the other day, Himself was ecstatic to see it outta here. I held my breath, hoping it would be taken, as I was promised, by the trash hauler. 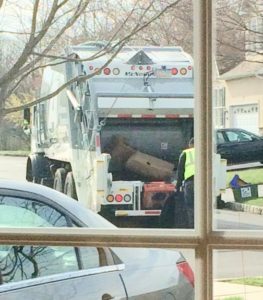 Himself, my sister and I were all in the kitchen when the trash guys pulled up the next day. We stared out that window, encouraged when the driver got out of the truck to help the other guy. That’s a good sign, since pitching that behemoth-beast into the truck was a two-man job. My son had already run screaming back to his house after yanking it to the curb. That thing was HEAVY! With a couple of loud grunts and probably a curse word or two from the trash guys (or was that me?) that sucker was soon laying in the bin like a dead whale, waiting for the hydraulic arm to come down and chop off its half broken head. Good riddance! Later that day, while my sister and I drove to New Jersey to visit a couple of her friends, the thrift store folk came to collect the chair, ottoman and recliner. Himself did not want to call and tell me that they did not take the recliner. I don’t always handle this kind of news well. “They said it was in too bad of shape,” he said. Okay. But I wasn’t surprised and had even suggested they might not take it. I had bought a cover for it after Christmas because I thought it looked crappy. But the cover was ill-fitting and it looked even crappier. It resembled a bad pair of plus-sized-tall-pantyhose on a petite woman, sagging and bagging everywhere, with the elastic never staying in place. And it almost instantly started pilling, like it had un-popped zits. It felt like I was brushing over raw rice wherever my hand touched. Guess that’s a better comparison than the zits, but not nearly as much fun to write. Anyway, I hated it more with the cover so I took it off before they came to collect it. Crappy. Crappier. Crappiest. It was its own English conjugation lesson. The painting is almost done. The carpeting comes on Thursday. The furniture we are getting comes on Friday. I’m losing my mind on Saturday. Again. I lose it a lot. Nothing dramatic about me. Ha-ha. The new recliner won’t be on that truck because of the “tariffs” that have been put in place by the “thing” in the White House. I don’t know the details and did have the energy to ask, but tariffs are causing complications. Image how that thrills me. Never mind. I toyed with the idea of keeping the other recliner until I get the new one, but I don’t want it besmirching my new carpet so that crappy recliner is still going! It can live in the garage until next Monday when it goes to the curb, gets chucked it the truck and visits the crappy couch in the Great Crappy Furniture Rejections Thrift Store in the sky. From cranking hair in my Midwestern town of Sheboygan, Wisconsin, to eastern Pennsylvania, to three years writing for large hotels in Jakarta, Indonesia, humor has been my constant.